DART Rail has catalyzed growth at CityLine/Bush Station. The massive CityLine development, anchored by State Farm's regional hub, sits adjacent to the station. 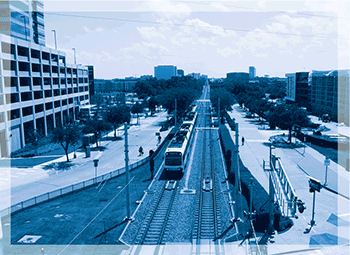 Transit-oriented development (TOD) is breathing energy into the cities served by DART. From Richardson to Irving and beyond, DART is fueling a new lifestylewith real dividends. A recent study confirms it: More than $7 billion in economic activity is being generated by projects completed or planned near DART Rail stations between 2014 and 2015, according to the Economics Research Group at the University of North Texas. A 2014 study from UNT identified $5.3 billion in transit-oriented development near DART Rail stations between 1996 and 2013. By contrast, the entire 93-mile light rail system was built at a cost of $5.5 billion. The regional economic benefit takes many forms. The new 2014-2015 activity could create more than 43,000 jobs - resulting in nearly $3 billion in wages, salaries and benefits. Further, the projects completed or under construction during the two-year study period already have generated $69 million in state and local tax revenue. The study predicts potential spending for planned or proposed developments could produce another $160 million in state and local tax revenue. "Increased property values and the revenues generated from that are ways Dallas and the other DART cities are benefiting from our investment," Dallas Mayor Mike Rawlings said. "DART has created new connections to attract developers to fertile areas for investment. We see that transformation in all parts of our city and are excited to see what's next." In North Texas, TOD has meant new mixed-use developments, a revitalized Downtown Dallas and reborn suburban downtown districts. Corporate campuses also are strategically locating next to DART Rail. "The investment and development activity around DART stations proves the wisdom of regional leaders in building a regional transit network," said Michael Carroll, Ph.D., director of the UNT Economics Research Group team.